We saw this project on the Paper & Stitch blog and couldn’t wait to give it a try at Revel! 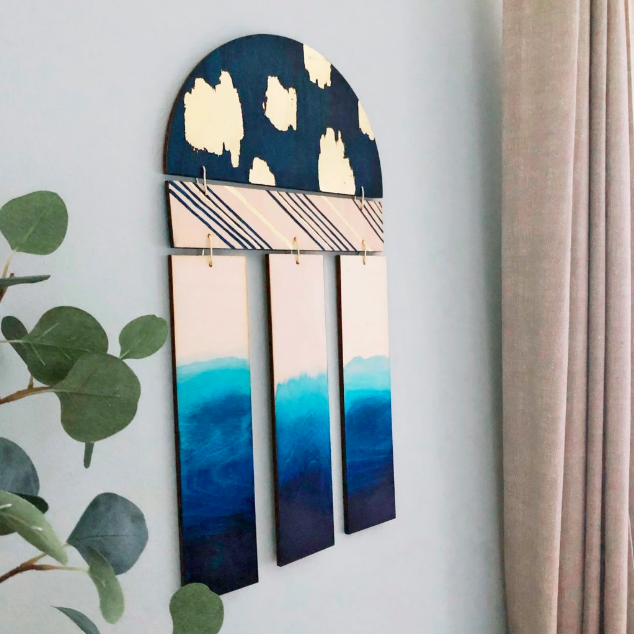 These sleek wooden wall hangings are the perfect accent to any wall, from the office to a nursery. And they can be customized in so many fun ways! During this workshop we will show you multiple techniques for embellishing the wood using paint, gold leaf, and patterned paper – then you’ll get to visit and relax while working on each piece of your wall hanging. Want to incorporate a custom word (“Welcome,” “Home,” etc) on the horizontal piece? Send us a note by Sunday 3/17 and we’ll have it waiting for you! Once your individual wood pieces are ready, we’ll help you assemble them and adhere a hanger so you’re ready to display your unique masterpiece as soon as you get home. Registration closes 3/13 to allow time for custom wood pieces to be cut. Workshop fee includes all supplies and instruction. Drinks and snacks available for a la carte purchase.